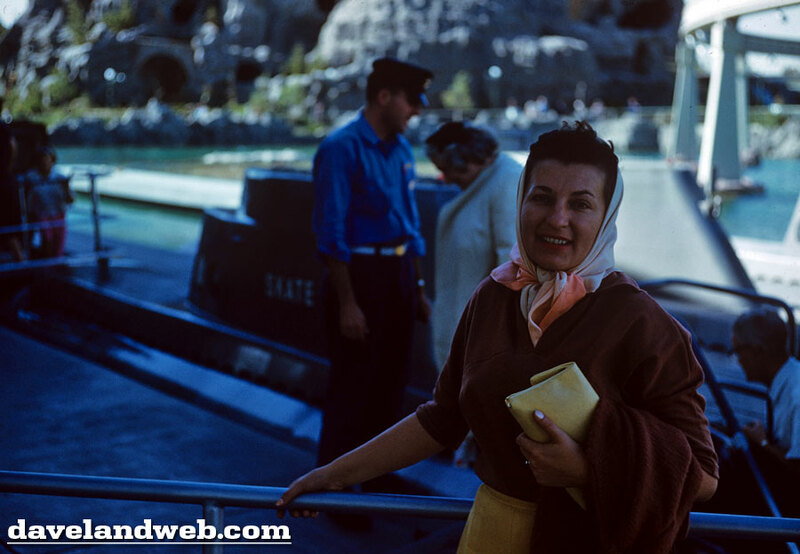 Scarf-gal loved Fantasyland; maybe she related to the princesses. Here she is, sitting outside of Sleeping Beauty Castle. A closeup shot shows the pained expression on her face (“Please don’t take another photo! I want to go to Fantasyland!”). Scarf-gal gets in front of the camera again, while off to the left, Millicent is having problems with her girdle. Scarf-gal is shamelessly trying to pickup a pirate as she laughs in the face of danger! Come back tomorrow for the conclusion of this series! 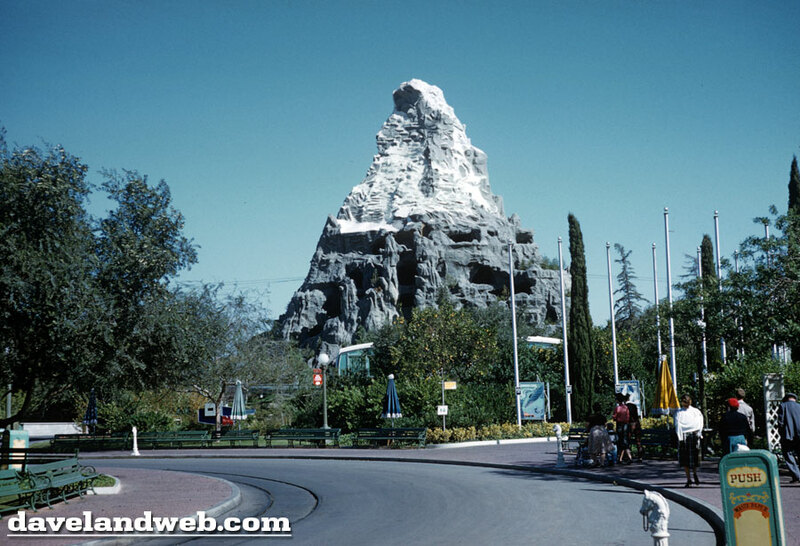 See more vintage & current Fantasyland photos at my regular website. 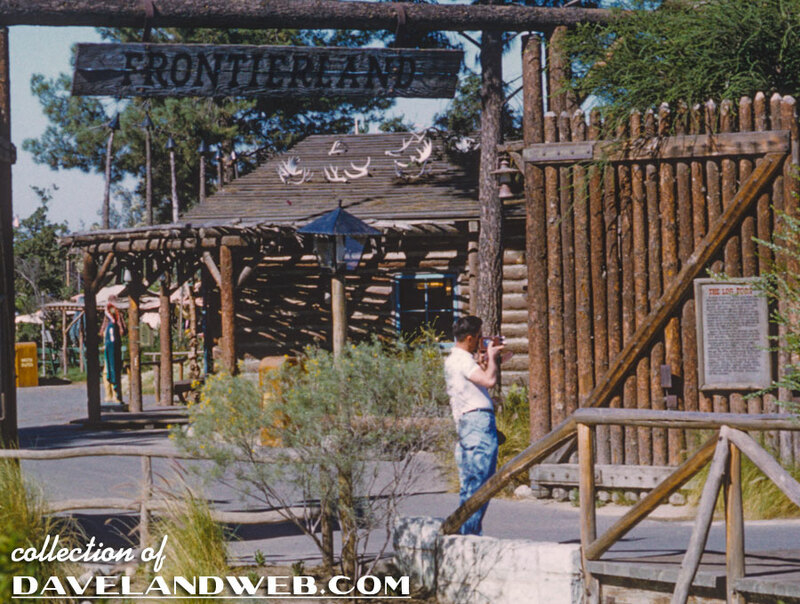 Today we do a little (very little) exploring of Frontierland, beginning with a shot of the gate. Shot #1 also captures another shutterbug who is taking a photo of the sign that tells the tale of the Log Fort. 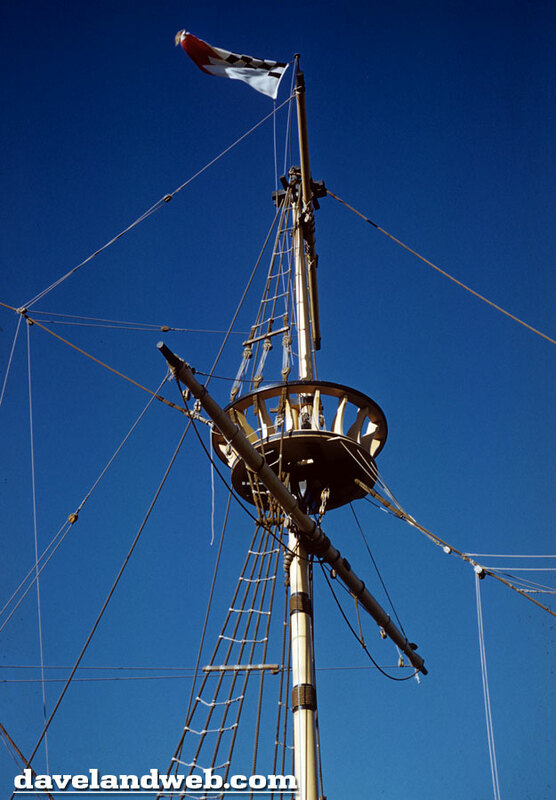 In this detailed closeup, you can also barely see the Wooden Indian on the left. 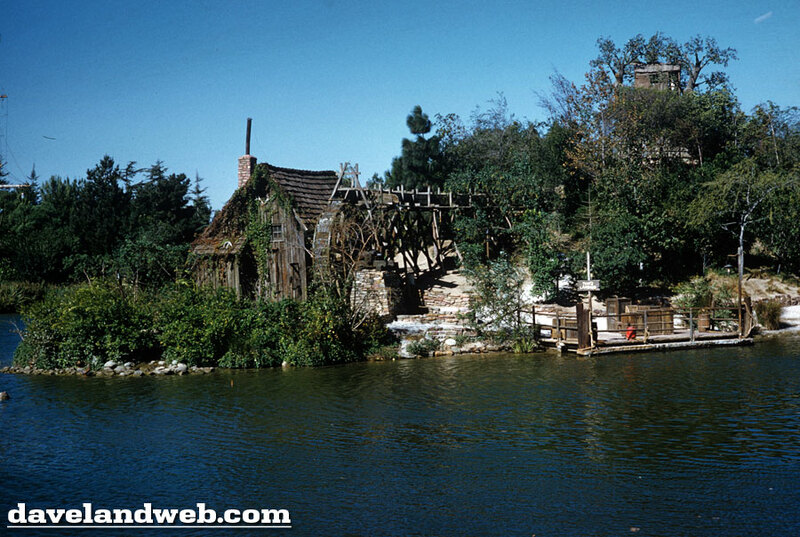 Looks like Tom Sawyer Island might be closed for business today; it’s a virtual ghost town. 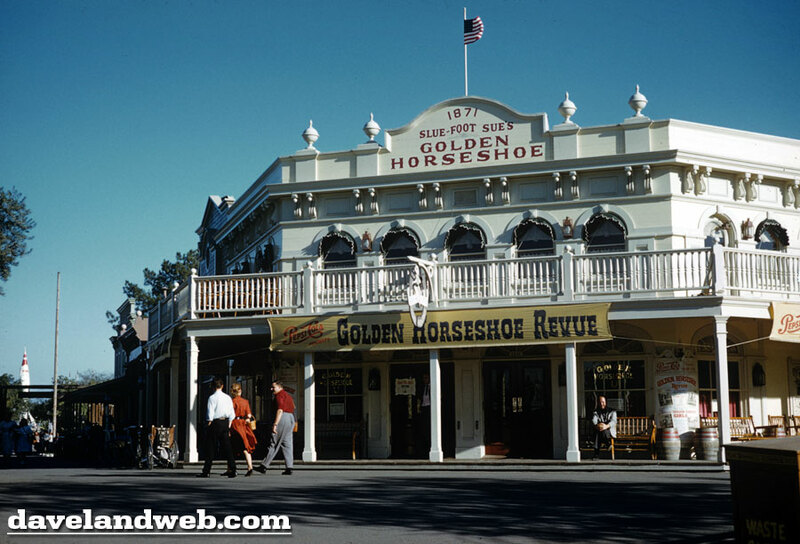 In this shot, you have a combination of the frontier (The Golden Horseshoe) AND the modern technology of tomorrow (The Moonliner). Scarf-gal’s husband/lover/partner/secret boyfriend/brother seems to be a little anxious; he can’t wait to get off that bench and check out the Can-Can Girls. 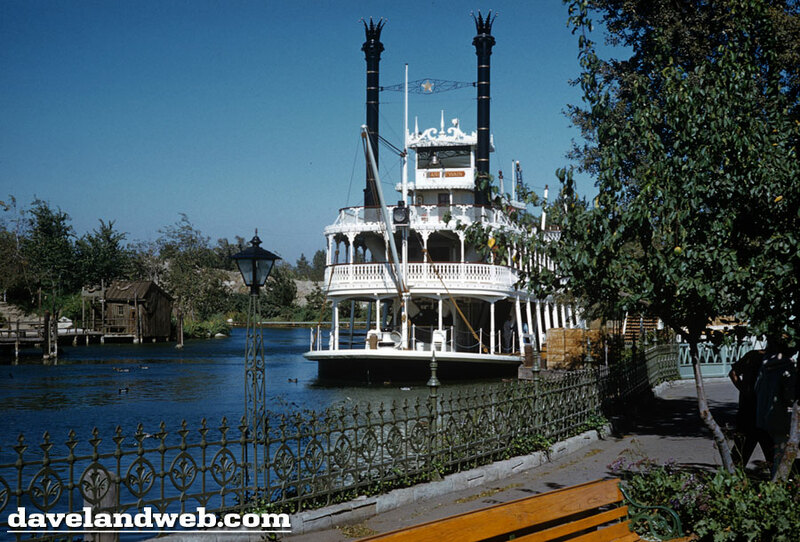 Leaving you in Frontierland for the day, we close with a shot of the Mark Twain; that wrought iron fence shor is purty! 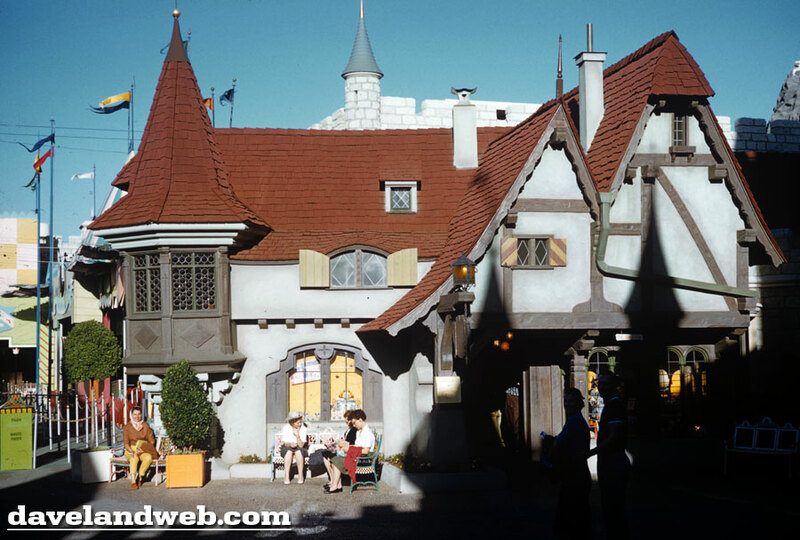 Tomorrow we visit Fantasyland. 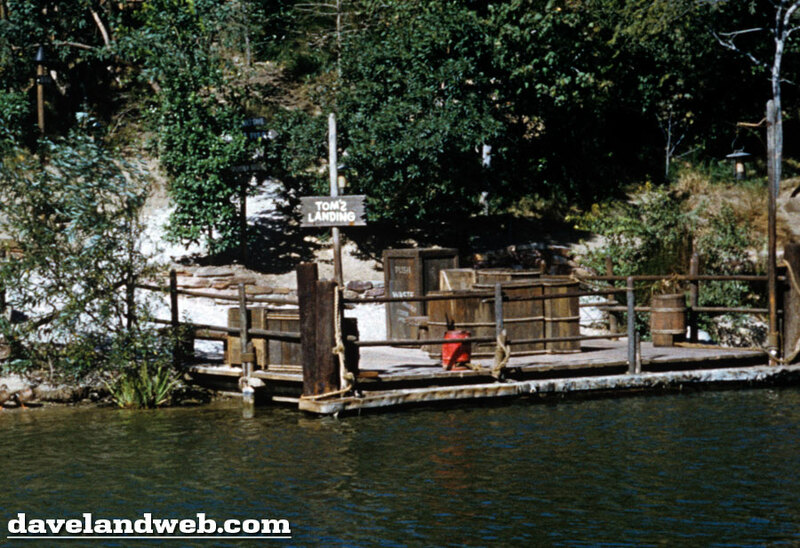 See more vintage & current Frontierland photos at my regular website. 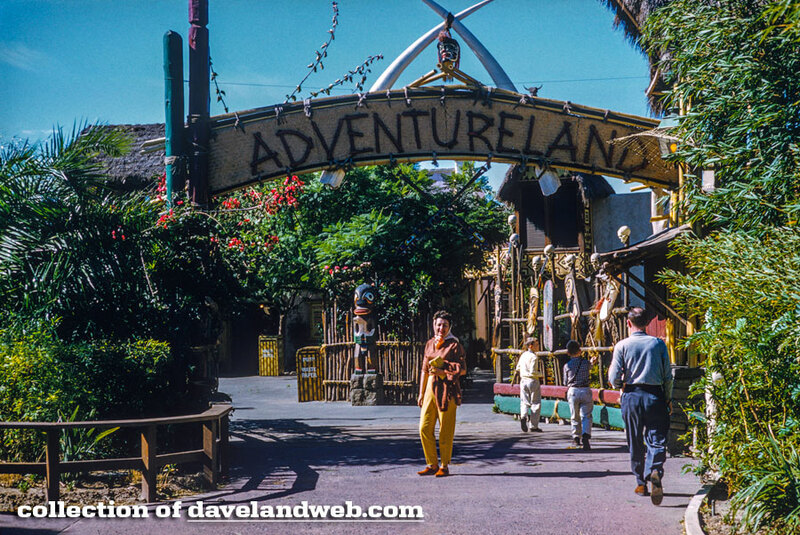 Get ready for Adventure, as we meet Scarf-gal at the gates to Adventureland. Our little buddy, the Tiki Statue, is there to greet her. 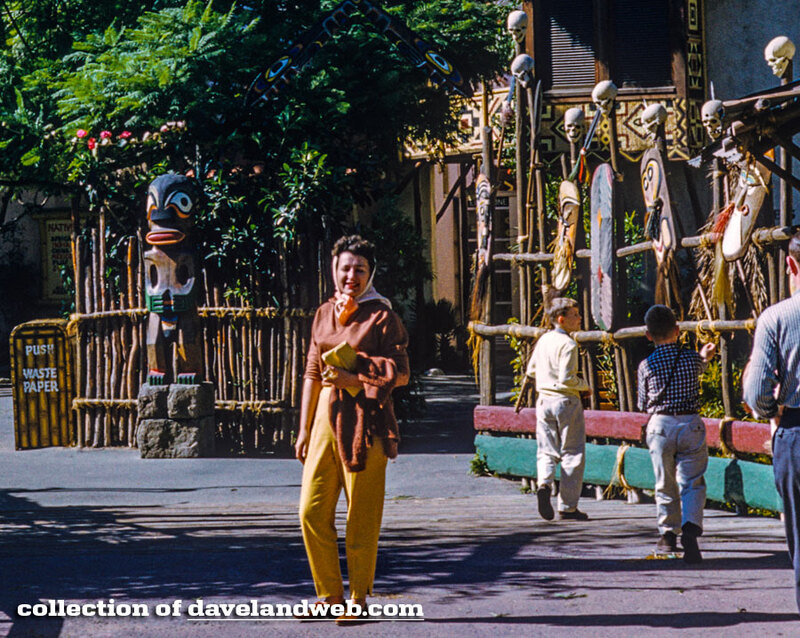 Those two little boys are sure checking out the Oceanic Arts carvings along the fence. 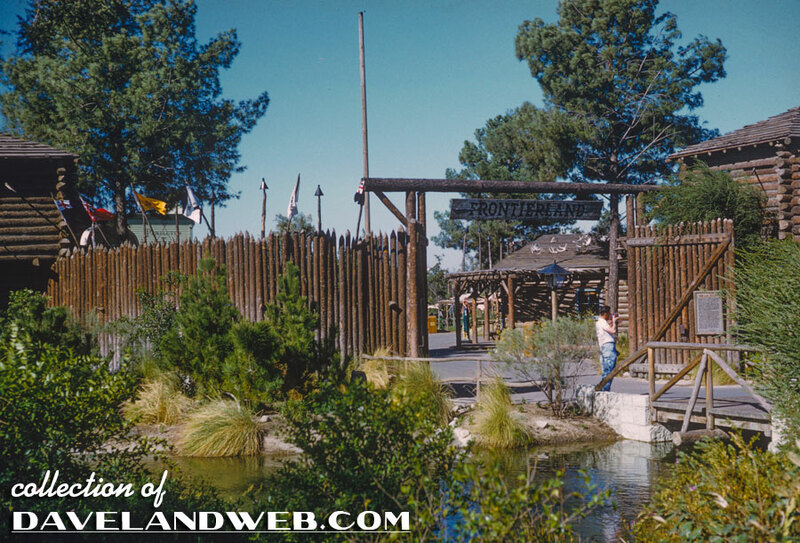 Tomorrow we visit Frontierland! 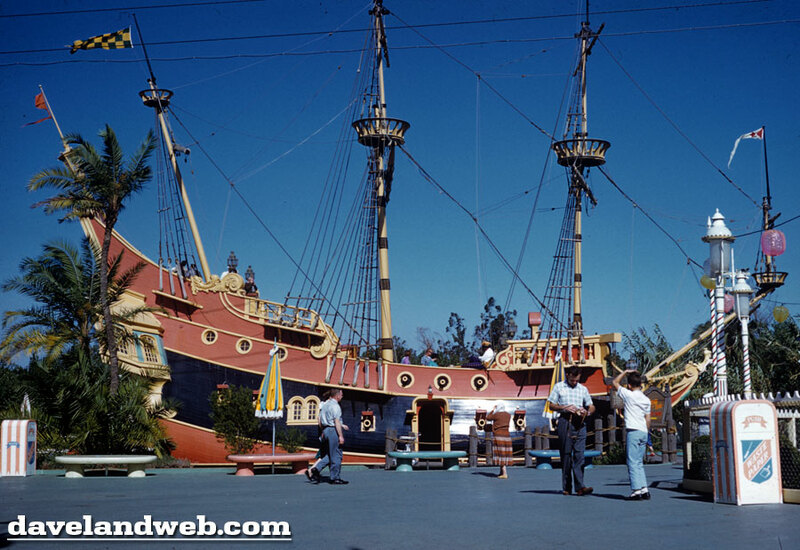 See more vintage & current Adventureland photos at my regular website. 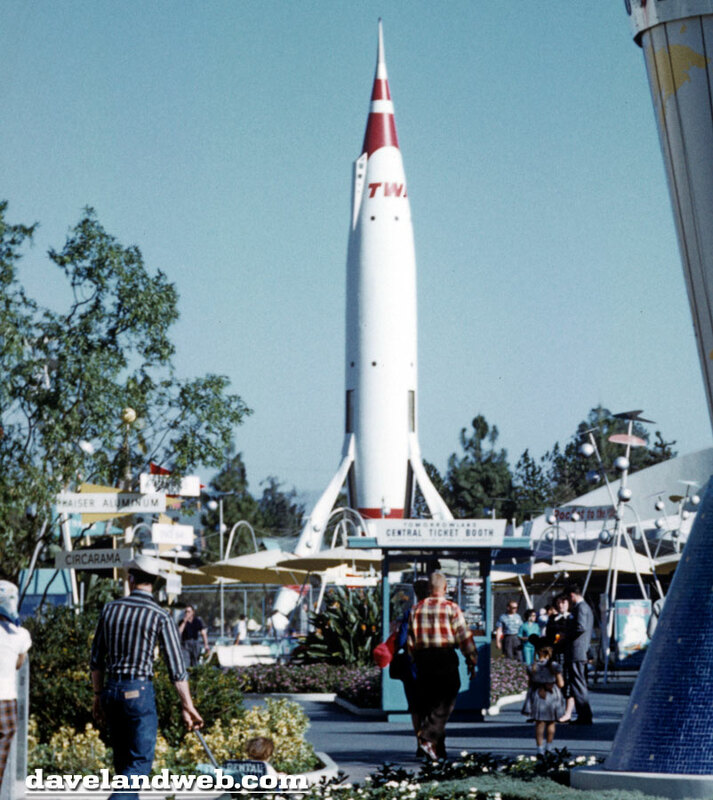 Scarf-gal is clinging tightly to her Astro Jet rocket as it circles around Tomorrowland. 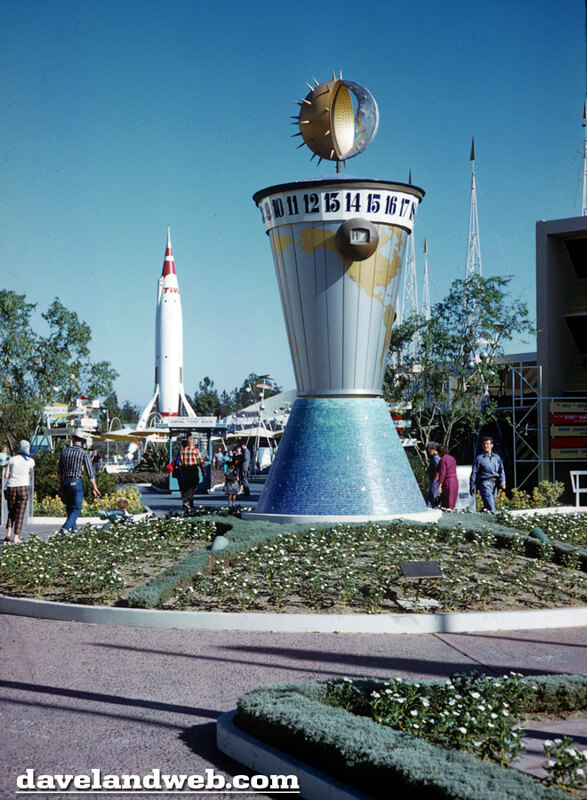 In shot #2, the Clock of the World provides a wacky welcome to all who enter Tomorrowland. Today, that wacky welcome (and a traffic bottleneck) is brought to you by the Astro Orbiter. If rumors are true, the Orbiter is destined to either be removed or returned back to its original site. 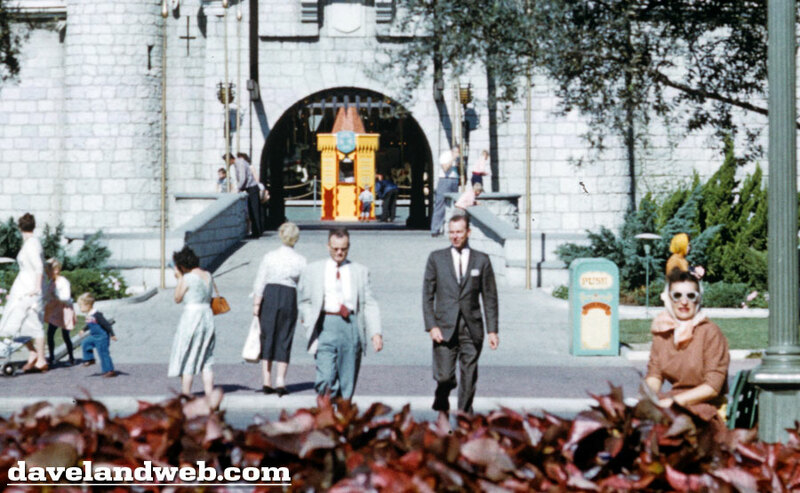 Either way, it will be nice to have the entrance to Tomorrowland cleaned up again. 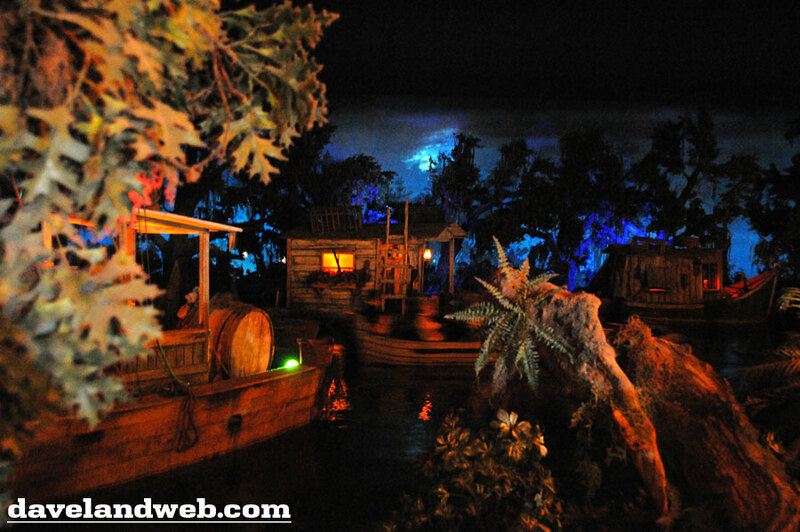 For have also included a closeup of the Moonliner and various signage. Tomorrow we visit other lands in this series. 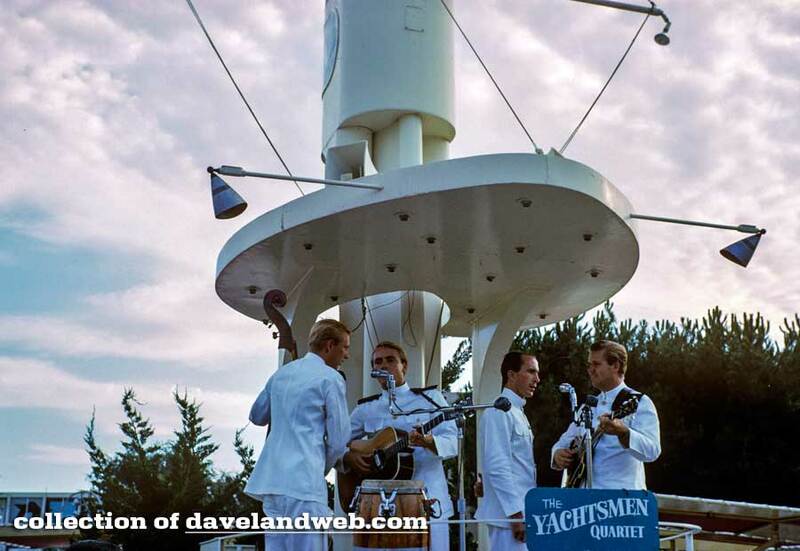 See more vintage & current Tomorrowland photos at my regular website. 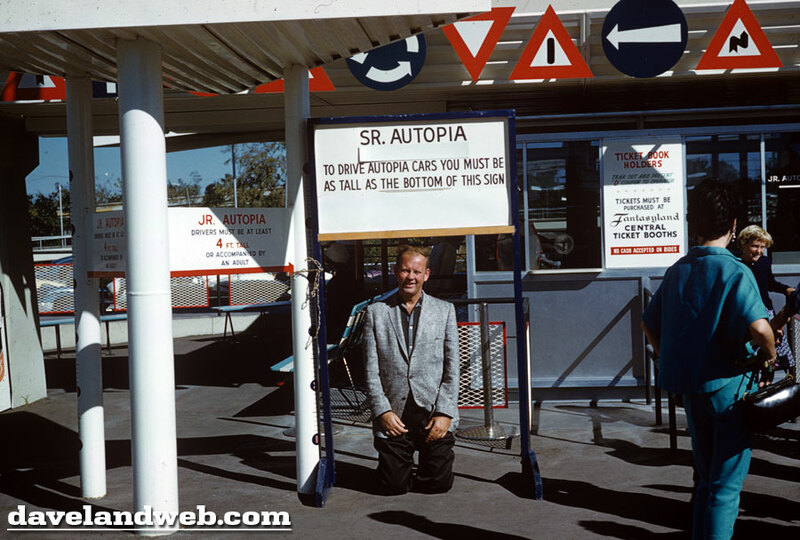 At the time these photos were taken, guests had a choice in Autopias; unfortunately for our photographer, he was probably just a little too big for the Junior Autopia. Can you imagine taking the time for a goofy shot like this today? You’d probably be run over by angry guests. 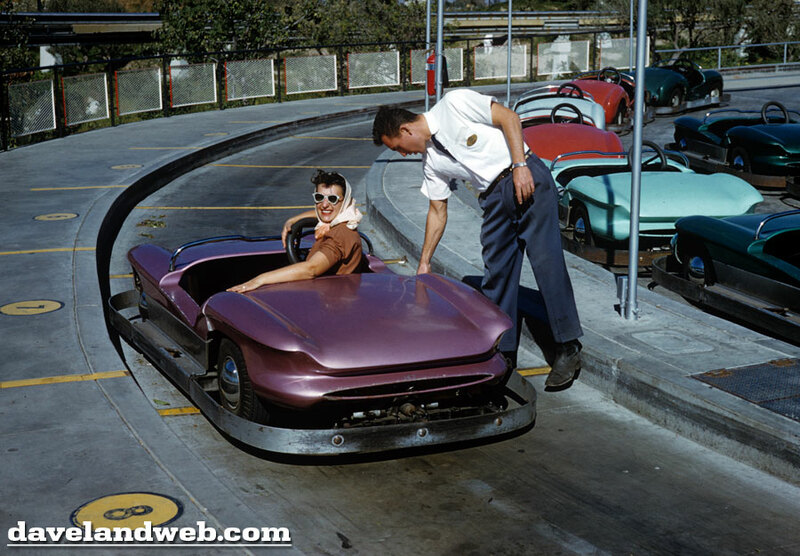 Scarf-Gal seems to be having a blast in her jaunty little Autopia car. 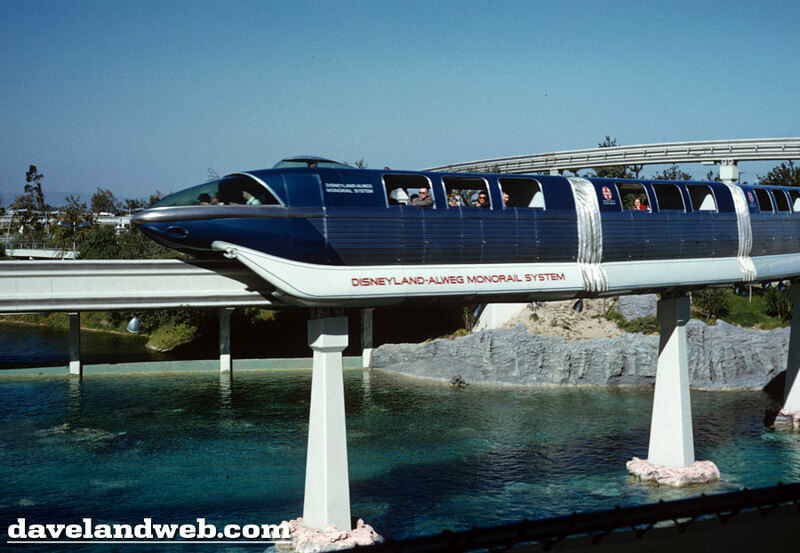 A beautiful blue Monorail is zooming over the Submarine Voyage lagoon. 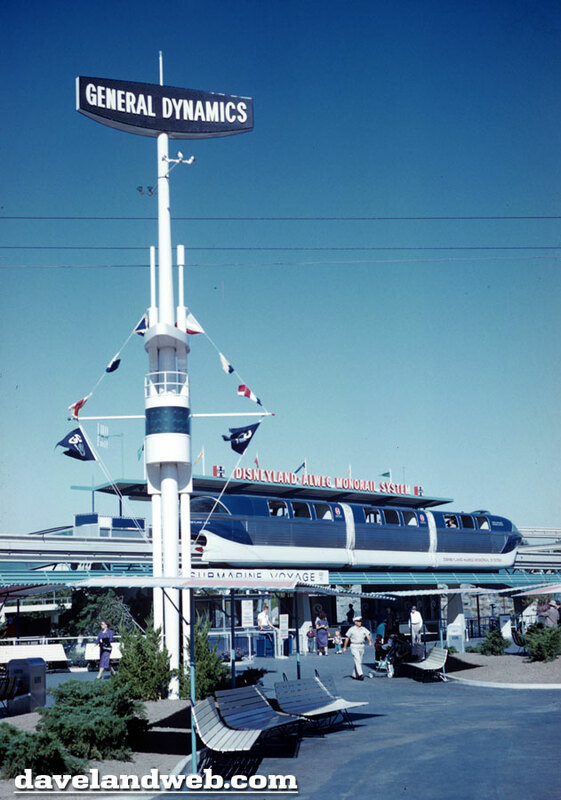 At this point, the Monorails were less than 6 months old. The General Dynamics sponsorship for the Subs is far from subtle here! Scarf-Gal actually looks a little seasick as she gets back to dry land from her voyage on the Skate sub. More to come tomorrow! 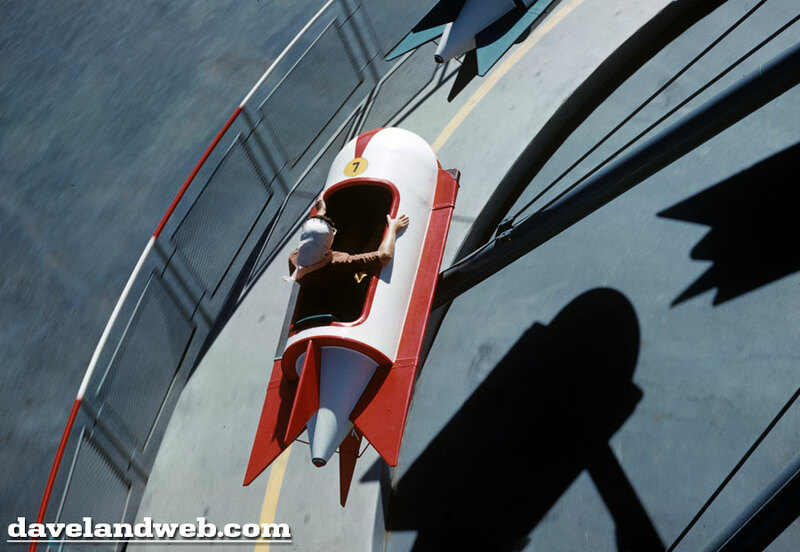 See more vintage & current Tomorrowland photos at my regular website. We have now entered the park and are facing the floral Mickey, just before heading through one of the underpasses beneath the Main Street Train Station. I have been to Disneyland so many times now that I usually rush through this area, attempting to avoid the clusters of newbies trying to figure out where to go. This is really a shame, as it was designed to create a sense of wonder, not boredom. Who could resist the train pulling into the station, steam pouring out of the locomotive and the whistle tooting, beckoning you to board for a grand circle tour? In this photo, the handcar is on the second track. 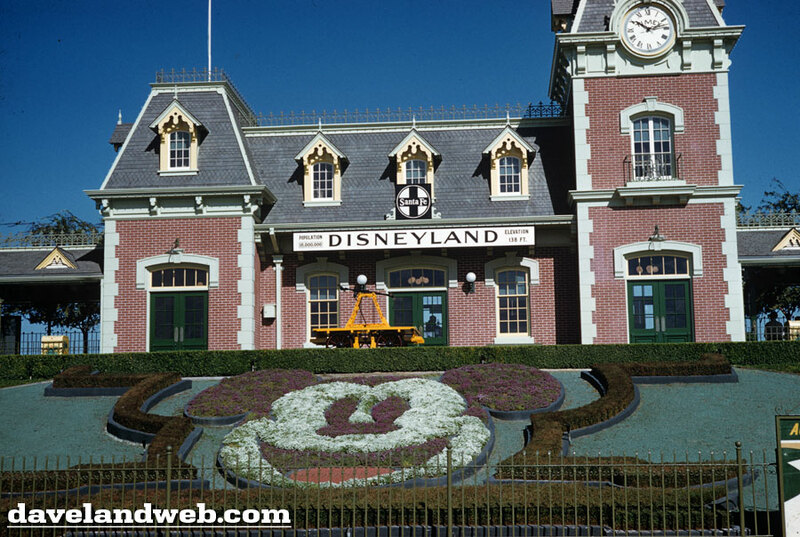 Today it would be rare to get an unblocked shot of the Mickey floral, as the majority of guests stop by to have their picture taken in front of this iconic piece of landscaping. 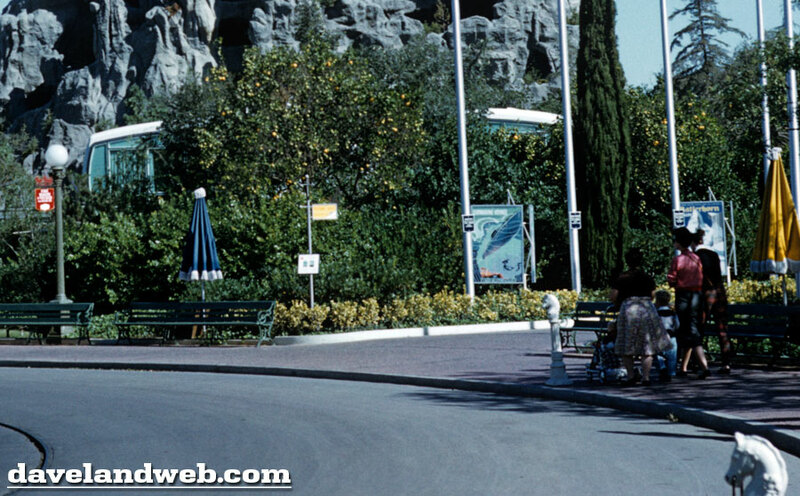 On the right side of the frame, just barely in view, is an Autopia poster. Putting attraction posters at the entrance increases the sense of excitement about the day and the difficulty of choosing which one to go on first. In shot two, our guests have crossed under and have another difficult choice: how to get down Main Street. 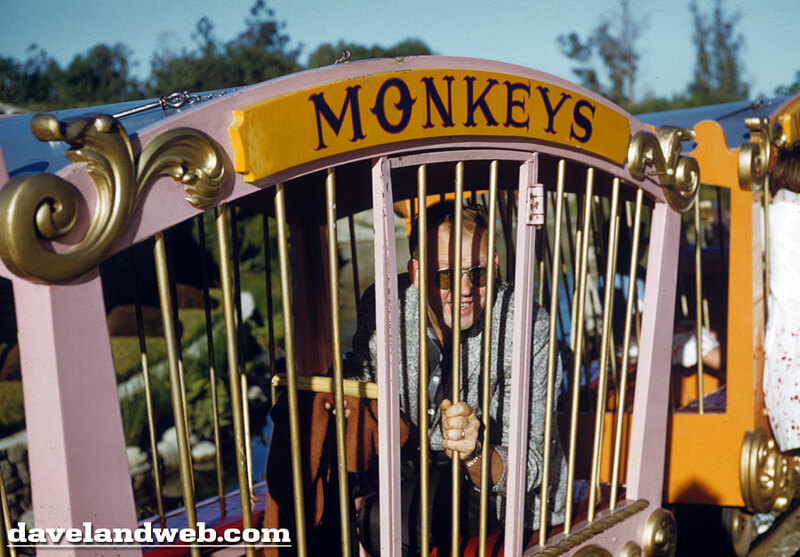 There are so many fun vehicles to accomplish this task; I often wonder how many guests go back and forth on different vehicles before exploring the rest of the park. 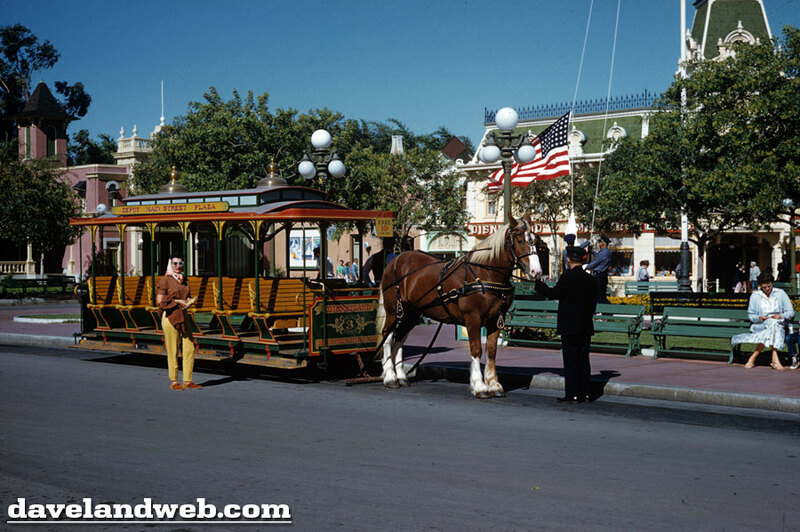 Our gal in the scarf seems to have chosen the Horse-Drawn Streetcar. In the background, it appears as if the flag is about to be risen. 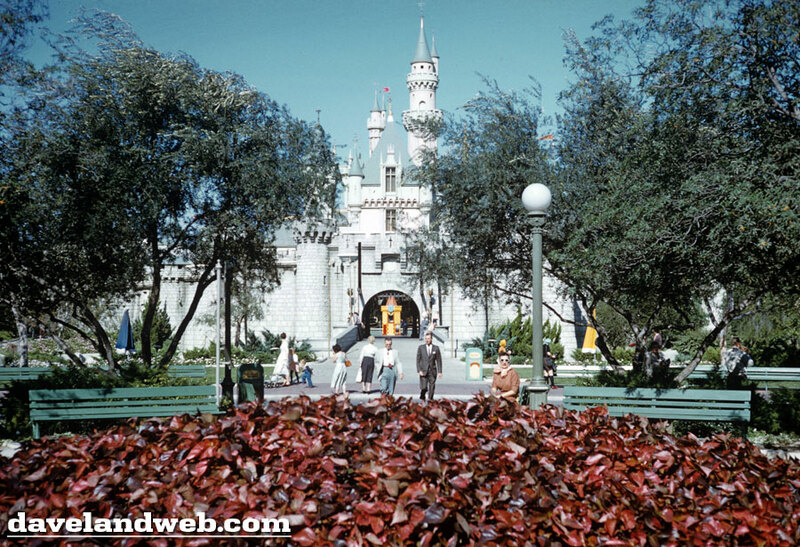 Over in Central Plaza, there is so much greenery that we almost miss the Monsanto House of the Future. 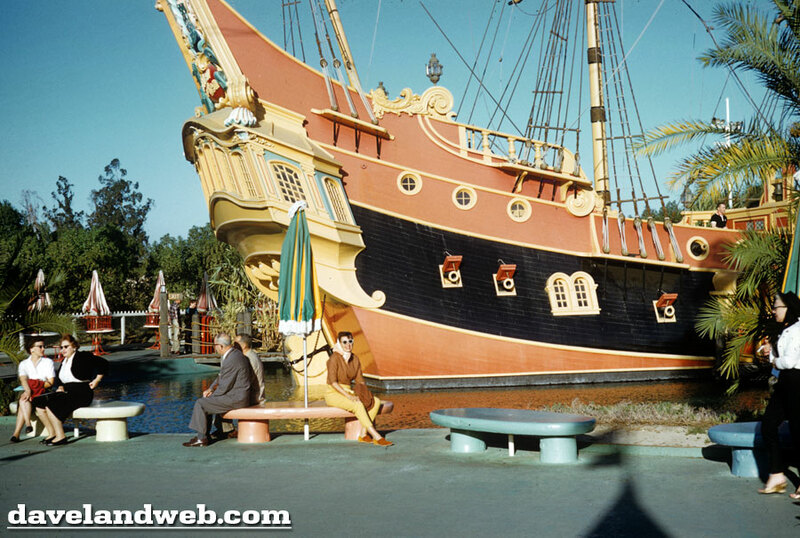 Come back tomorrow for more Technicolor 1959 images. 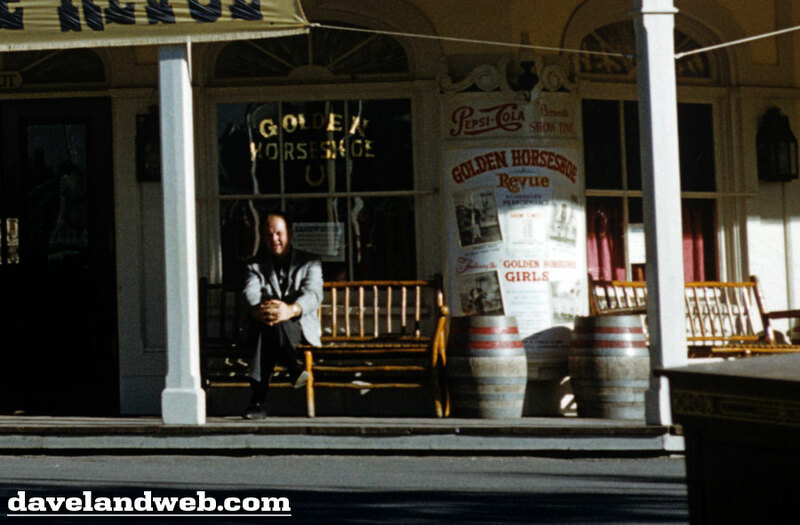 See more vintage & current Disneyland photos at my regular website. As the countdown to my 1000th post draws nearer, I decided to share some of the REALLY good stuff with you Daveland readers. This 11/59 series ranks amongst the best of the best of my collection and I hope you enjoy these as much as I do. 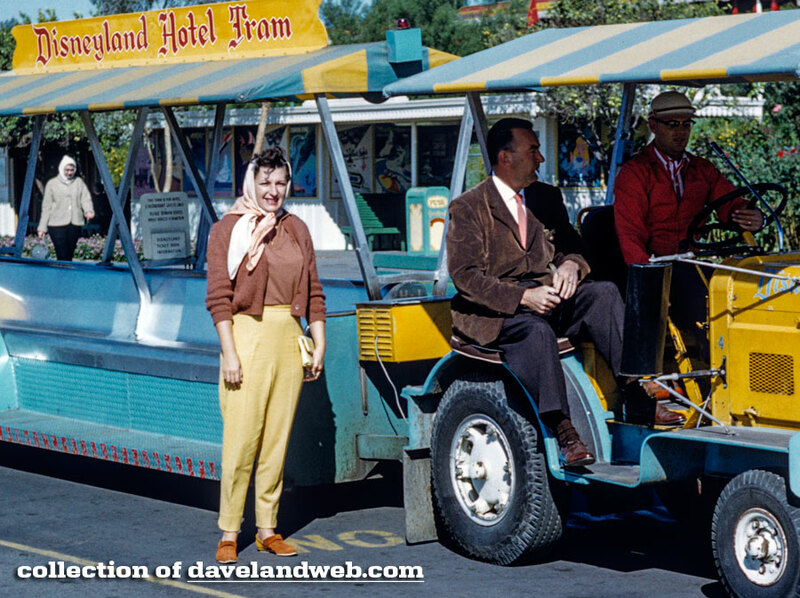 This initial series post begins at the Disneyland Hotel, as our subject stands with some very classic vintage autos! 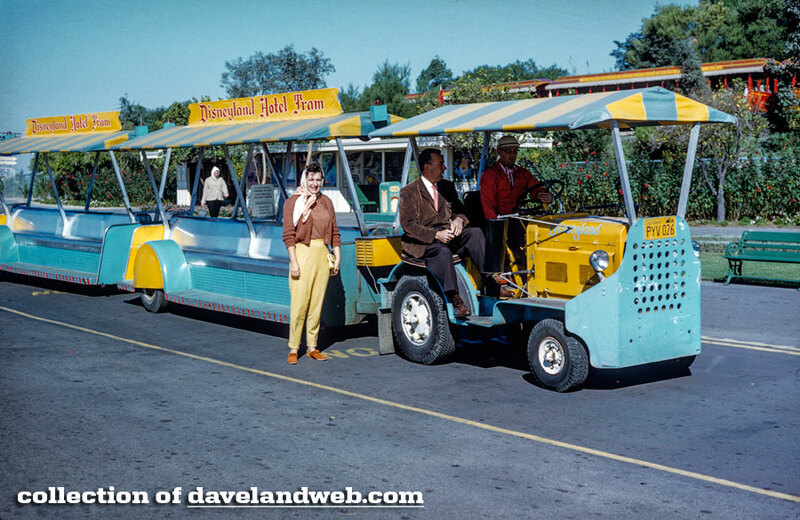 In shot 2, she has just gotten off the tram and is ready for a day of fun at the park. Hope her buddy stops taking pictures soon; looks like she’s already missed the train at the station! That tram looks like it could probably plow the fields at the farm, too. 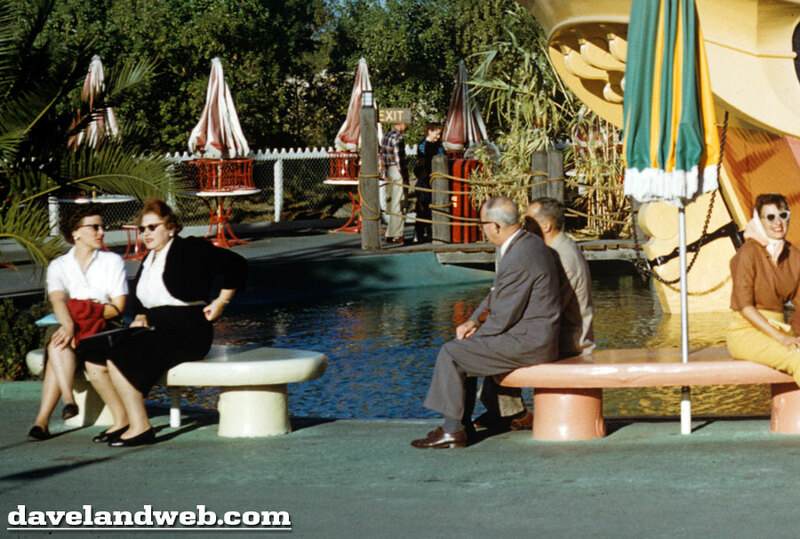 Let’s zoom in for a closer look at those choice attraction posters in the background. 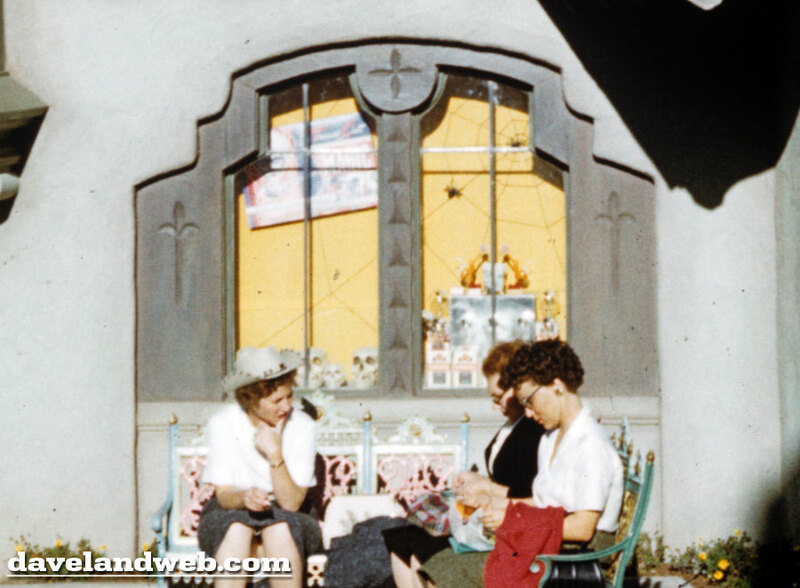 The right of her head, you can see the Sub poster, and right next to that is the rarely seen Disneyland Hotel poster. Somebody needs to tell the guy in the brown jacket that there’s no smoking on the tram! Oh wait...that message is about 30 years too soon. 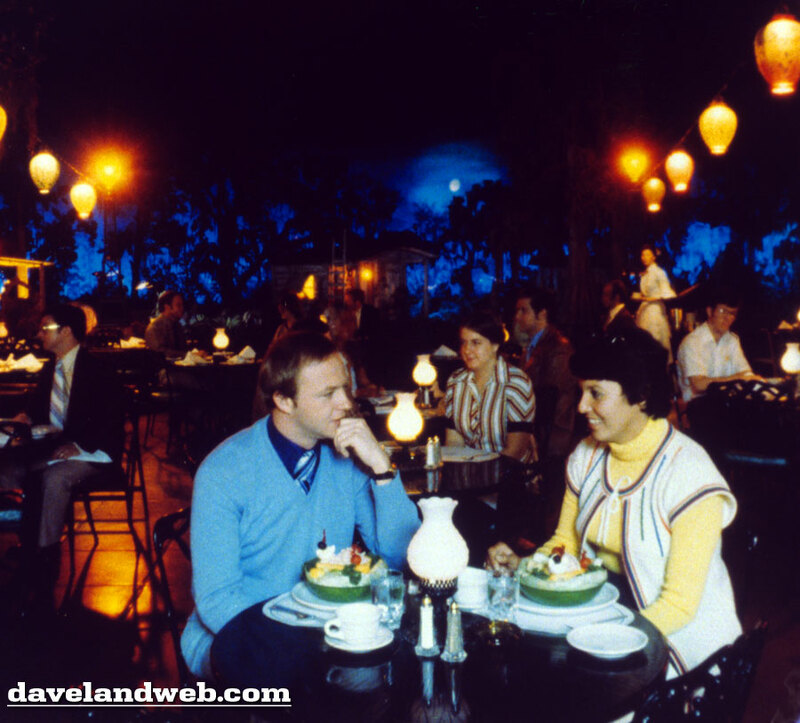 The Blue Bayou restaurant was an overwhelming favorite in a poll I posted here awhile back. 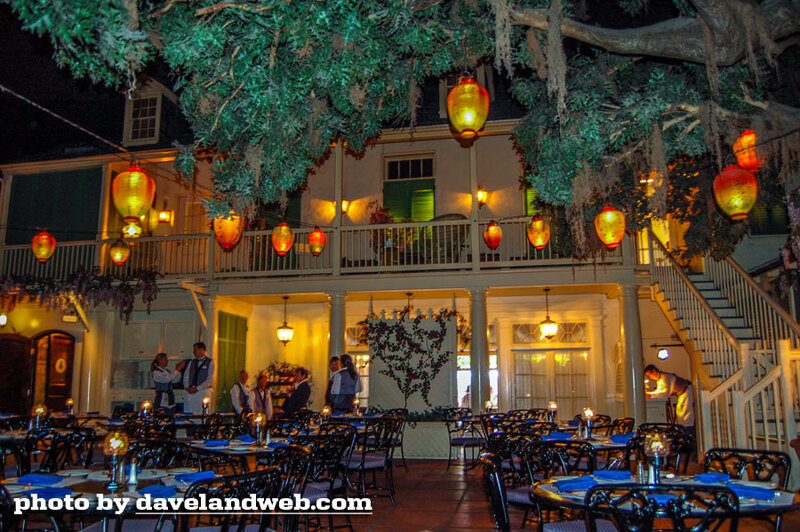 Unlike most of the other restaurants in the park, it is very difficult to get a seat on the spur of the moment. 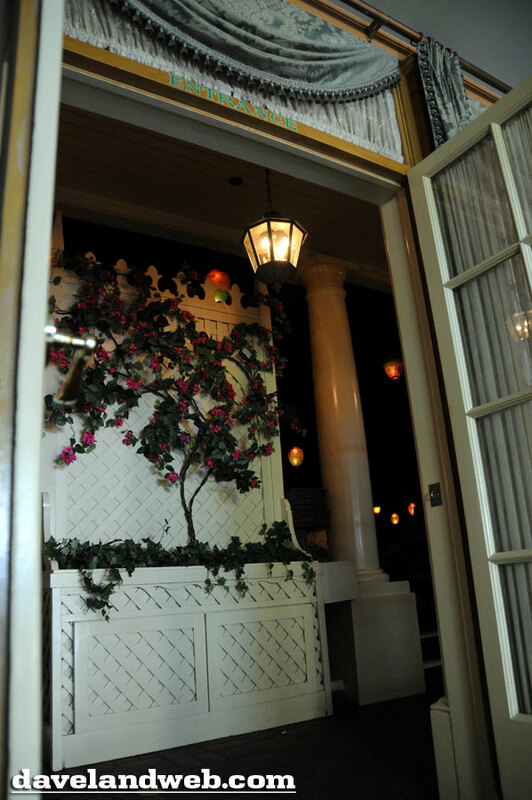 It is probably the most special restaurant experience in the park next to Club 33, which is unattainable for most guests. What makes this place so darn special? The biggest reason is the atmosphere. 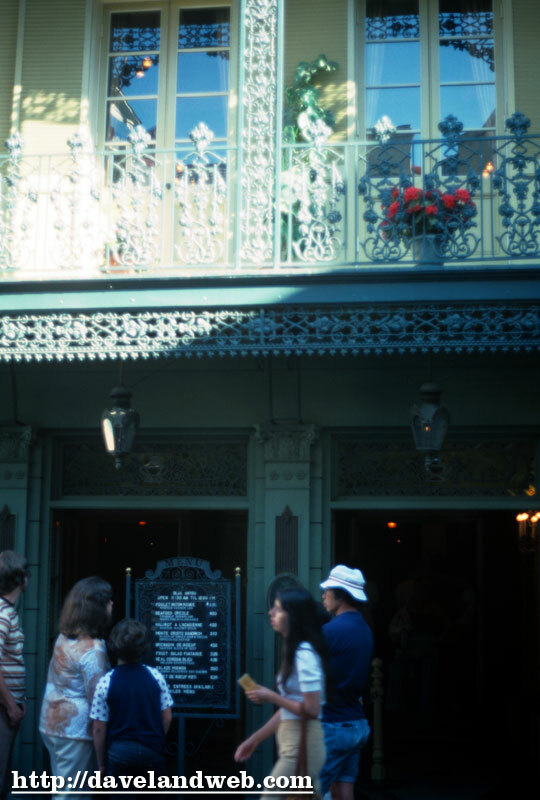 Even the waiting area is themed and beautifully appointed in accordance with the New Orleans area in which it resides. Once you walk into the restaurant, you lose all sense of time. 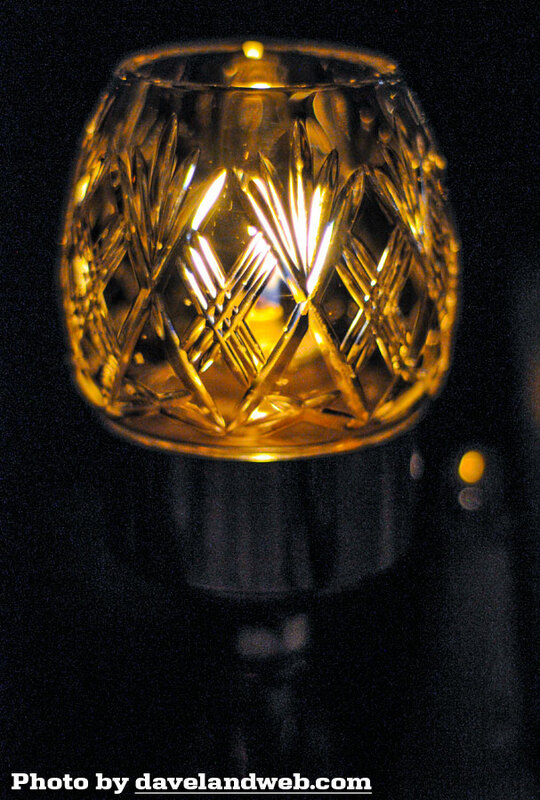 It is perpetually dark in the Blue Bayou, lit only by candles and the green glow of fireflies. 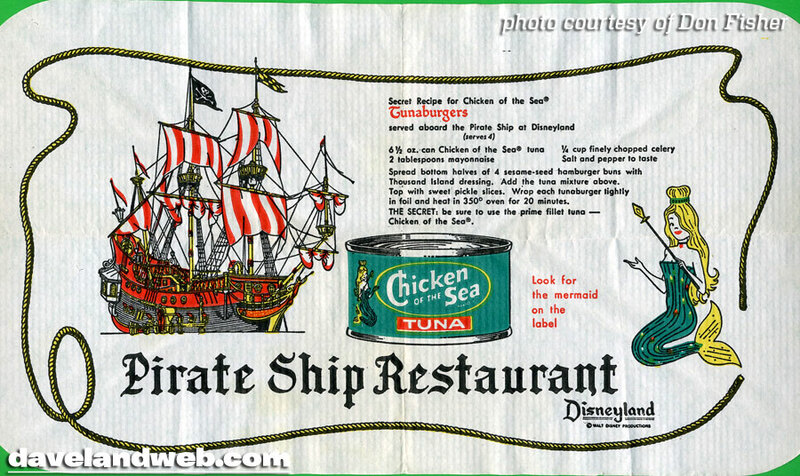 The seating area actually faces the Pirates of the Caribbean attraction, and guests float by as you eat your meal. 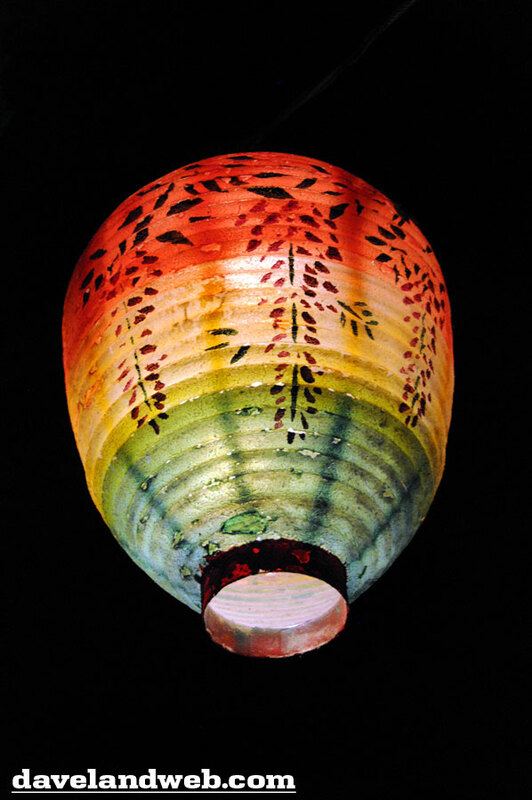 I love the Chinese lanterns that hang overhead; one of these days I'm going to find a set for my backyard! 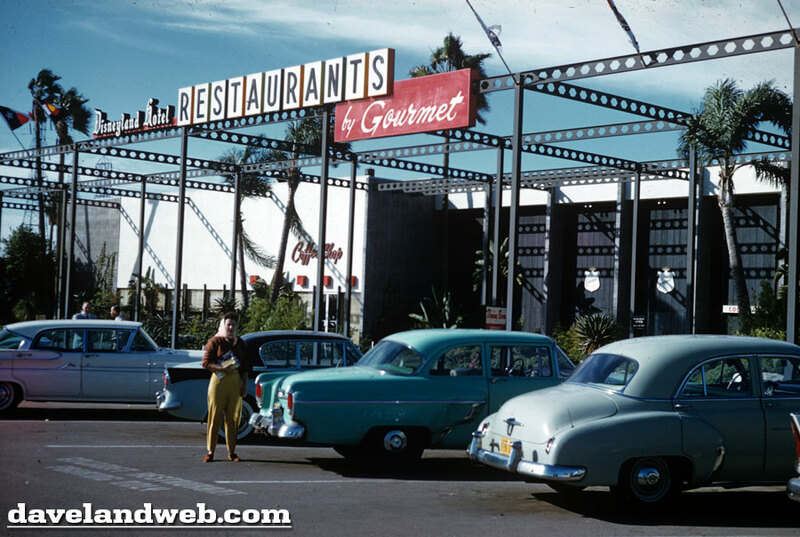 Here is an early publicity shot (obviously posed) from the restaurant’s early years. The service is also excellent here. 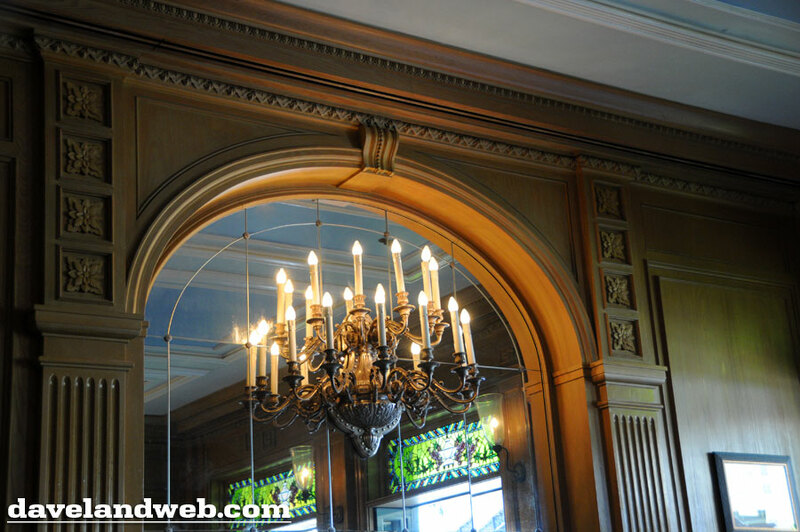 Guests usually have approximately 2-3 waitstaff per table, between the waitress/waiter, staff serving bread, and staff busing the tables, keeping them clean between courses. Besides quantity, the staff here is usually of a much higher caliber than I have noted in other restaurants at the park. 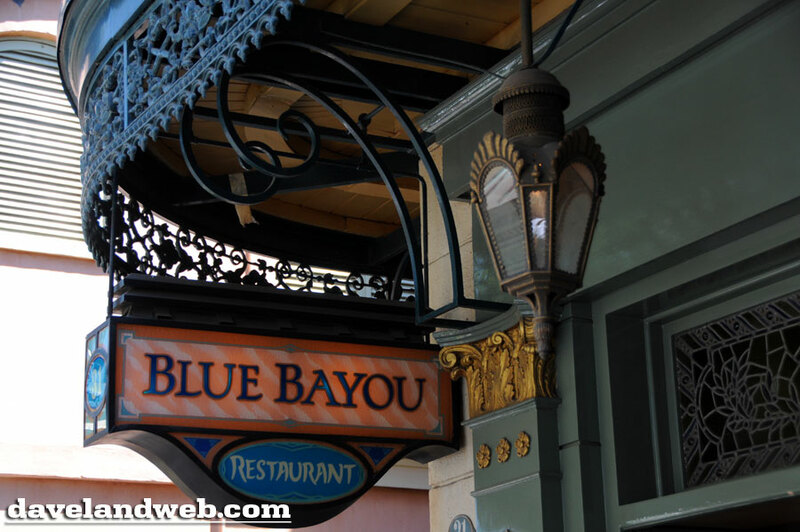 Across the way, Cafe Orleans serves very similar food, however, the staff is usually not as polite or attentive as the ones at the Blue Bayou. And the food? 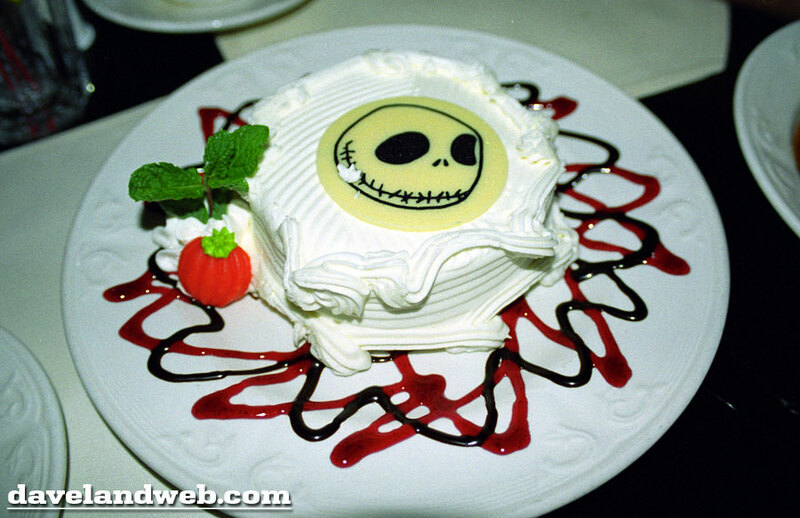 It’s not as good as what I’ve enjoyed at Napa Rose, but it is probably the best in the park. 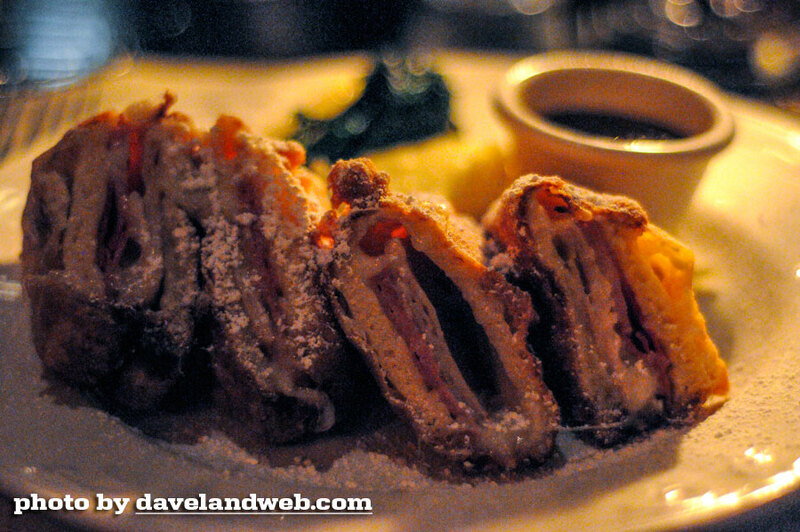 The notorious favorite is the Monte Cristo, which is basically a real artery clogger but tastes so good going down! Once you eat one of these babies, expect to be lethargic and in a food coma for the rest of your day at the park. I have noted on my last trip though that the portion seemed smaller (but still plenty to fill you up, as the previous portion was huge) and it also seemed to be less fried...are they trying to make this classic more healthy?!? 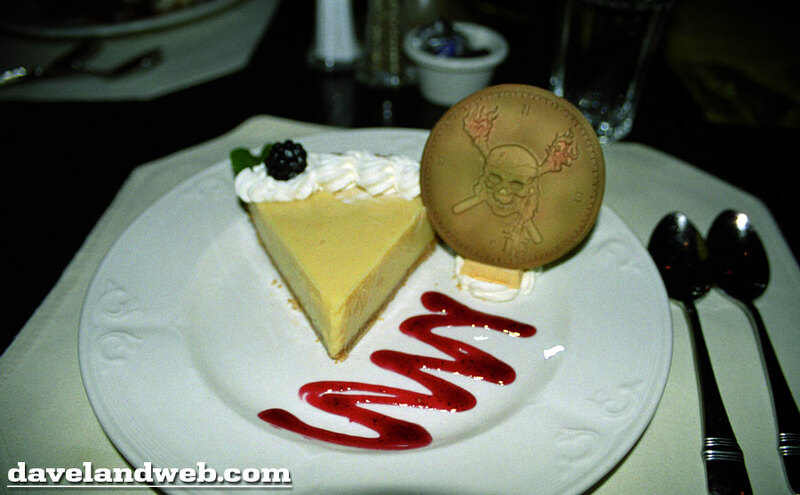 Desserts are often themed here according to the season, but none compare to an offering from long ago: The Fried Cheesecake. 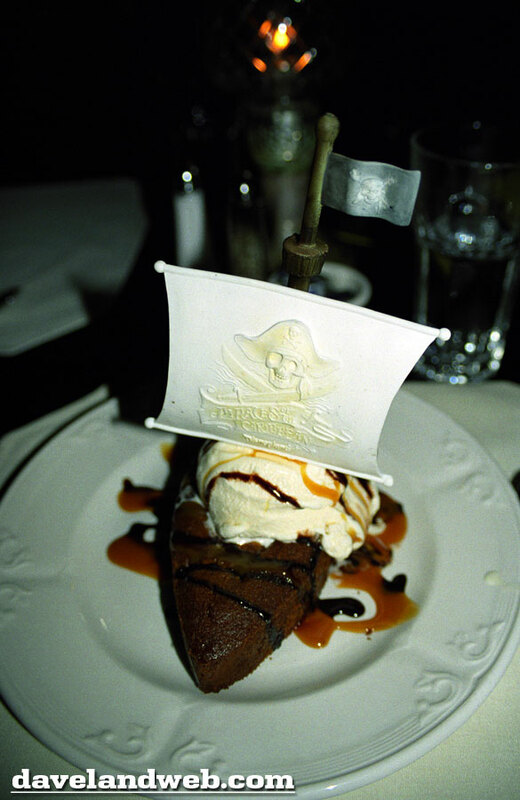 Oh how I miss that delectable concoction! 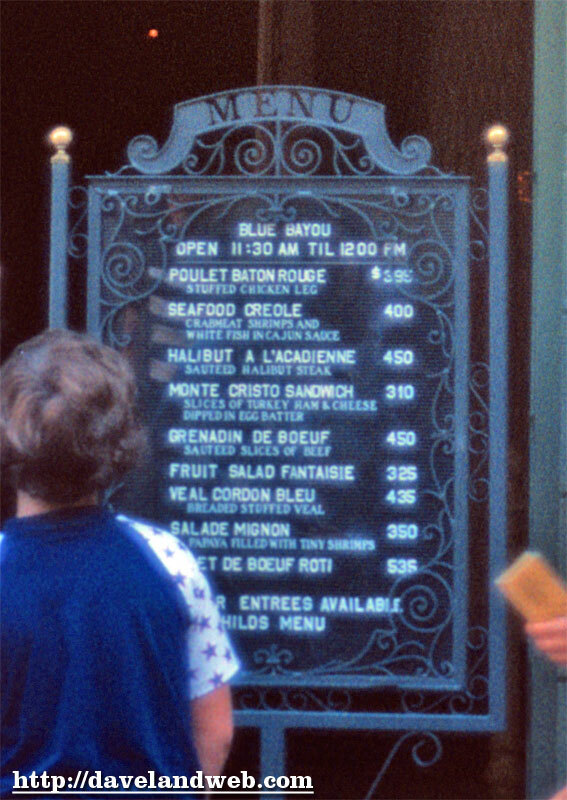 Prices have changed just a bit! 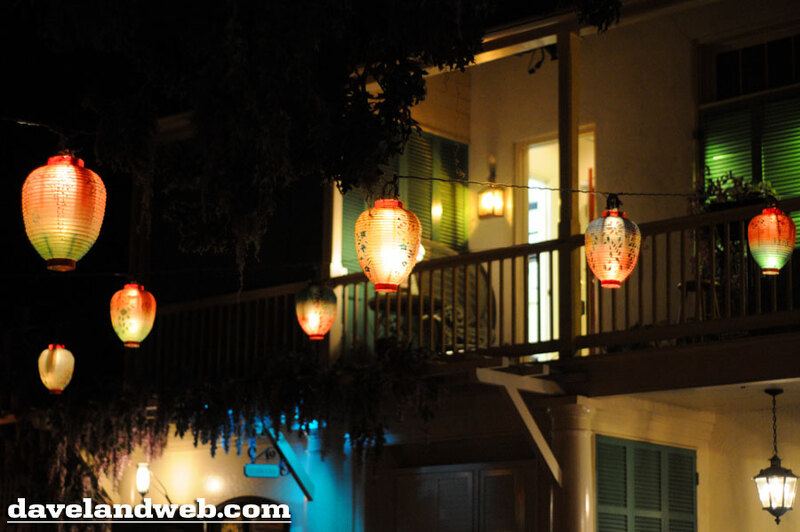 See more vintage & current Blue Bayou photos at my regular website. Just keep paddling, folks...nothing to see here!